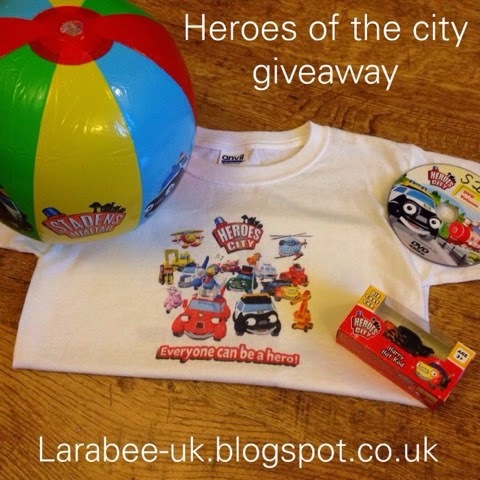 Heroes of the city is one of T's favourite cartoons so when we had the opportunity to offer our first solo giveaway, review the cartoon and checkout a merchandise pack, you can imagine that we jumped at the chance. Heroes of the city follows the main characters Paulie police car and Fiona fire truck's rescue adventures in the town, the cartoon promotes friendship and teamwork to solve the misadventures, mostly caused by Calamity Crow! Aimed at 3-7 year olds, each episode is just over 10 minutes long, I think T 'found' it whilst on other firefighting cartoons on Youtube but I must admit I didn't actually realise that they had their own channel, of course we've now subscribed. For the purposes of review, we were sent the season 2 DVD, which has been on play at every available time and requested even on no TV time! Also on the youtube channel are art and craft ideas with Calamity Crow, I'm sure we will be checking these out and some point. You can also follow Heroes of the city on facebook. We've had so much fun watching the DVD for this review, I'm certain that it will remain one of T's favourites for a long time. Only comments are mandatory but a follow on facebook and twitter will give you extra chances. Disclaimer: we were sent a Heroes of the city merchandise bundle for the purposes of this review and giveaway, however, all words and opinions are our own. Has to be Paulie the police car! Fiona Fire Engine, because we had a house fire.